The 2015 AMYA Sanctioned RC Laser National Championships was hosted this year by The Villages Model Yacht Squadron in Florida on January 17-18 and it was a nice warm break for the many skippers who travelled from the cold north. Skippers travelled from MI, TX, NJ, NY, MD, AL, Bahamas and all points of the compass in Florida to compete in the two day championships. The weather and wind was the best seen at Ashland Pond in The Villages for many a regatta with 5-10 mph from the East on Saturday and turning due West 5-10 with gusts for Sunday. Most competitors will be returning home with the beginning of a nice sun tan. 32 skippers raced Saturday using Odd/Even scoring. Racing was very close and competitive with eleven skippers from the 32 getting line honors. Top five Saturday evening being Dave Ramos (2014 Champ), Dave Brawner, Alan Perkins, Ron Stephanz and Jim Kaighin. Sunday dawned with the wind now in the West directly down the lake enabling Race Director Ricky Gerry to set the perfect course up and down the lake. The fleet now split into two based on the overnight score raced in the Gold and Silver fleets for the Championships. Racing in the Gold fleet was very competitive with Dave Brawner digging himself out of some amazing situations to overtake Dave Ramos and Jon Luscomb coming back from 6th overall Saturday evening taking third, Jim Kaighin also showing his true form coming 4th whilst Ron Stephanz 5th and Alan Perkins 6th dropped back in the gusty conditions. Similar close racing took place in the Silver fleet with 5 different skippers taking line honors. The overnight order changed dramatically for Steve Lippincott having a disastrous Sunday dropping from 1st overnight to 11th However Theresa Gay showed the guys the way home with a very steady series of results followed by Jack Ward, Don Harthorn and Henry DeWolf. Special awards went to Theresa Ray Gay for first Place Women, Henry DeWolf first Place Ancient Mariner, Raffle winner: Dave Brawner, (New RC Laser), Henery DeWolf (Free registration for 2016 RC Laser NCR). 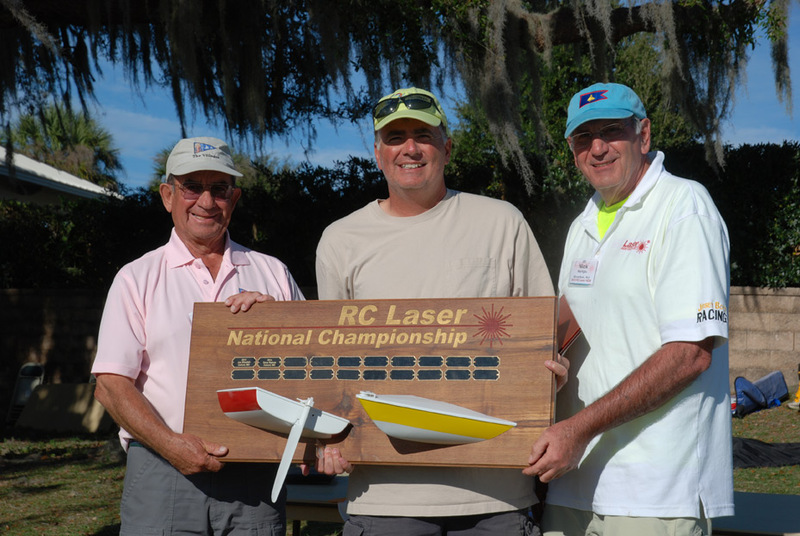 Summary of 2015 RC Laser National Championships.